Qualified retirement plan assets are popular planned gift vehicles due to the unique tax advantages they present and the ease with which a donor can update disbursement instructions. Tax-deferred retirement plan assets are not taxed until they’re withdrawn by the account holder. If someone other than a spouse receives retirement assets upon the death of the account holder, the transfer is taxed and often at a higher rate than other assets. Nonprofit organizations can receive these assets–contributions and earnings–without any tax liability, enabling you to give less-taxed assets to heirs. Most retirement plan administrators allow account owners to update their account beneficiaries at any time. Directives for disbursing these assets can be made or updated outside your will, often through the administrator’s website, by phone, or by completing a mail-in form. 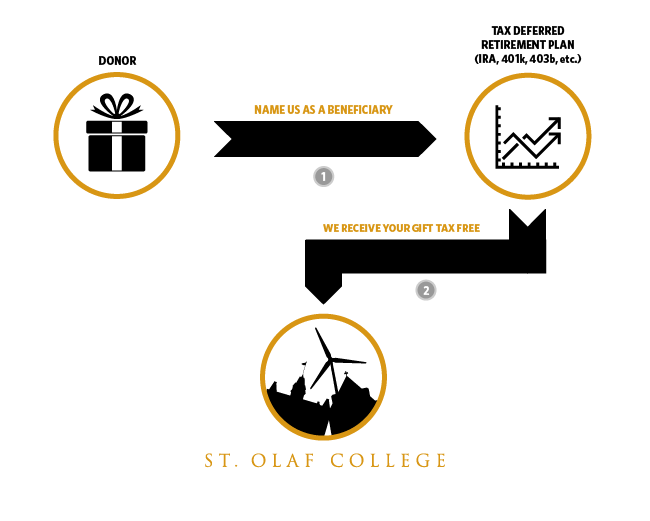 Contact your retirement plan administrator to learn how to name St. Olaf as a beneficiary of your retirement plan. As it may be required to complete the beneficiary designation process, our federal tax ID number is 41-0693979. Our Minnesota tax ID number is 20133. Beth named St. Olaf as a beneficiary of a retirement plan. It’s an easy, tax-savvy, and generous way to give.